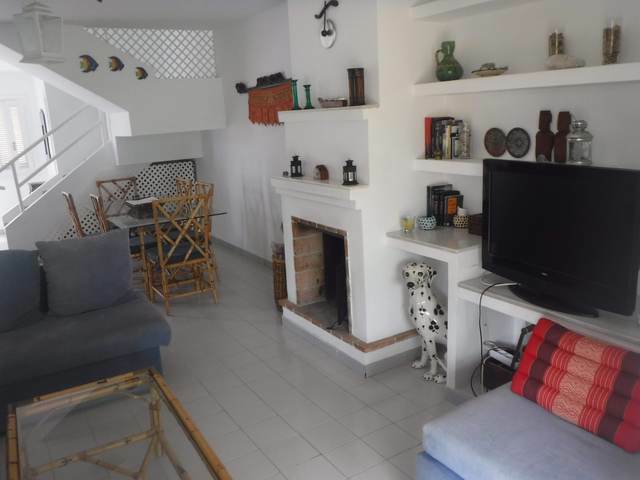 Very spacious South facing town house in an excellent location, in the quiet residential area of El Palmeral, only 50m to the beach and all amenities. Ground floor 49.78m2, first floor 37.33m2, basement 32.2m2, entrance terrace 32.2m2 and back terrace 15.9m2. You have an entrance terrace with BBQ leading into the lounge-diner, cloakroom, large separate fully fitted kitchen, from the lounge you have patio doors leading to the second terrace which has direct access to the beautifully landscaped communal garden and swimming pool. 3 double bedrooms with fitted wardrobes (one with an ensuite shower room), further family bathroom. Internal access via the staircase in the lounge to the basement/garage with 2 rooms and a bathroom. Ideal for extra accommodation, storage or garage. There is air conditioning and heating in the lounge and 3 bedrooms, double glazing throughout and comes fully furnished and equipped. Ideal for a family holiday home, winter use as has all day sunshine, or all year round residence. Excellent rental property for those interested in earning an extra income. 2 minute walk to the beach, all the amenities of Mojacar and Garrucha are a few minutes drive and the local bus stop close by takes you to Mojacar, Garrucha and Vera. Almeria 45 minutes drive, Murcia 1 hour 20 minutes and Alicante 2 hours.